There are a million reasons to love Christmas morning. For our family at the top of the list is gathering together with our family and friends to eat our Christmas brunch. We try to keep it pretty simple, and have added different items to the menu over the years, but a must have is our Christmas Quiche. 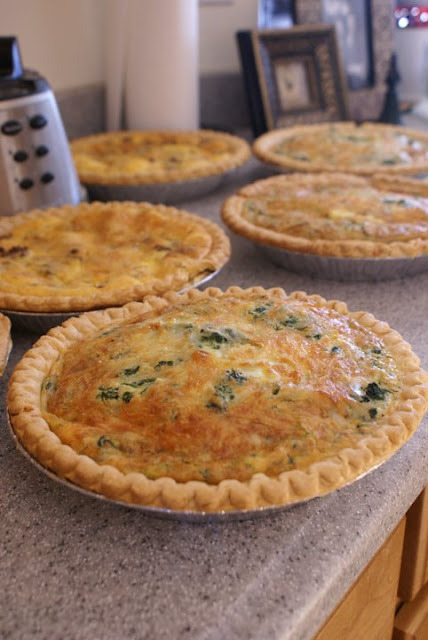 Quiche is a simple egg pie. The fillings you add can be adapted to your family's tastes. Our two favorite are a Spinach-Swiss and a Sausage-Potato. I promise you they are no more work than one of those "overnight casseroles" but are so much more elegant than a spoonful of everything plopped on a plate. To make a quiche you need a pie dough. Now you can wither make one from scratch if you want to, but in my opinion...it is too much work for breakfast! So, I use either a pre-made refrigerator dough or frozen pie shells. They make life so easy on Christmas morning! Saute the chopped onion in a little butter until translucent and add the spinach. Heat through. Add two cups of filling to each pie shell. Spread out. Top with grated cheese. Add egg mixture over the top. Mix together in a blender and pour over quiche filling. Fry the sausage in a non-stick skillet adding the chopped peppers. Once the sausage is cooked add the hash-browns and cook until browned. Season to taste with pepper. Add two cups of filling to each quiche pastry. Top with 2 cups of shredded cheddar cheese. Makes enough filling for two. Remember that quiche can be served warm or cold. I have also made my fillings the day before to speed up the morning. They also make a fantastic dinner entree! My Swedish pancakes are such a cheat. I buy the frozen Swedish pancakes and Lingon Jam from Ikea. Shhh...don't tell! Seriously, I have made everything from scratch for so many years, until I bought the Ikea pancakes for my daughter's wedding brunch and oh my...they were so good. All you have to do is heat them in your oven! To make the Lingon Berry sauce, I take two jars of Ikea's Lingon Berry Jam and heat with a cup of water on medium heat until the jam loosens into a sauce. I love the red of this sauce...it is so Christmasy. Add a few sprinkles of powdered sugar and they look like Christmas. Blend together gelatin, lemonade, orange juice, and pineapple juice until gelatin if dissolved. Stir in soda. Garnish with oranges. I hope you enjoy these recipes. We have loved them for well over 30 years. Merry Christmas!